The reed warbler is a summer visitor to southern Britain, arriving around the end of April and leaving in September; they spend our winter months in the African tropics. 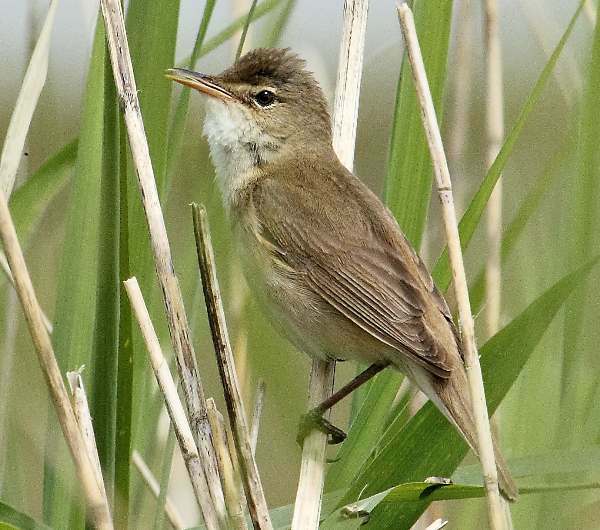 Reed warblers are quite common songbirds found mainly in marshy areas of Southern Britain. They are sometimes mistaken for Chiffchaffs; these two little birds do look quite similar but their songs are very different. The Reed Warbler's rasping, repetitive 'churring' song cannot be confused with 'chiff-chaff-chiff-chaff' call of its dubious doppelganger. Reed Warblers are often found where large reed beds fringe lakes and slow-flowing rivers. The male and female are almost identical in size (12.5 to 14cm long) and colouring. They feed on insects caught either on the wing or by hunting among the bank-side vegetation. 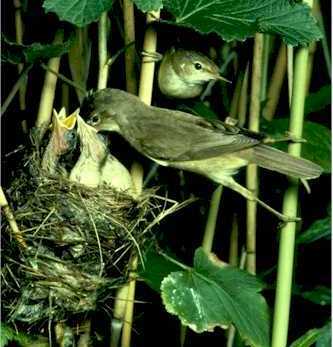 The nest is usually suspended between reed stems; there a batch of typically four eggs is incubated in about a fortnight; the young fledge two weeks after hatching, and often a pair of Reed Warblers will produce a second brood before the summer is over. This page includes pictures kindly contributed by Will Bown and Melvin Grey.